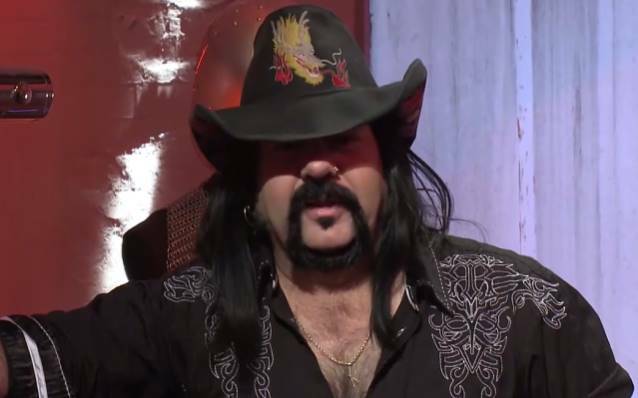 Former PANTERA and current HELLYEAH drummer Vinnie Paul Abbott and HELLYEAH frontman Chad Gray were interviewed on a recent episode of the French show "Une Dose 2 Metal" on L'Enorme TV. You can now watch the entire chat beginning around the 18-minute mark below. Asked about the recent 20th-anniversary reissue of PANTERA's 1994 album "Far Beyond Driven", Vinnie Paul said: "I really don't ever think about it. To me, it's something I did in the past, it's something I'm very proud of. And I've moved on and moved forward in my life. This [HELLYEAH] is what I do right now; I love doing this. But I do understand the 20-year history there that makes it very special. "'Far Beyond Driven' was a record that was probably ahead of its time, and to this day, it still sounds as fresh as just about any other band that's out there. It was a record that was pushed to another level. We made this mountain with 'Vulgar Display Of Power', and that was a pretty damn tall mountain to climb. But you know what? If you're gonna beat that, you've gotta go to this level." He continued: "I'm cool, I'm glad that people appreciate it. It's always gonna be around. There's new fans that are coming to it all the time. But it definitely is history. It's part of history. "People always ask me, 'Is there gonna be a reunion?' 'Are you gonna do something with Zakk Wylde [BLACK LABEL SOCIETY, OZZY OSBOURNE]?' or whatever. And it's just, like, no [late PANTERA guitarist] 'Dimebag' Darrell [Abbott], no PANTERA. It just doesn't fly; it's not gonna work. "But it is definitely part of heavy metal history, and I'm glad people still appreciate it and wanna hear it, and at some point, maybe they'll realize there's other things out there too." Dimebag's longtime girlfriend Rita Haney in 2011 called on Vinnie and former PANTERA singer Anselmo to settle their differences in honor of Dimebag, who was shot and killed by a crazed gunman while performing with DAMAGEPLAN at a Columbus, Ohio rock club in December 2004. Vinnie Paul recently told Revolver magazine about the possibility of a PANTERA reunion with Zakk Wylde filling in for Dimebag on guitar: "If you had an ex-wife, and it was a pretty bitter split, you might not ever want to talk to her again. Who cares if everybody in the family and your friends want you to say hello again? It's your choice whether you want to do it or not. And I think a lot of people are selfish. They say, 'Oh, he oughtta just kiss and make up with Phil and everything will be cool. And then they can go get Zakk Wylde and everything's gonna be great.' No, everything's not gonna be great."